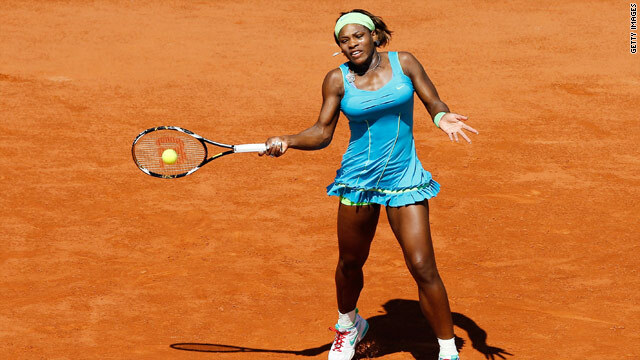 Serena Williams was taken to a first set tie-break before reaching the second round of the French Open. (CNN) -- Top seed Serena Williams is through to the second round of the French Open after a straight sets win over Switzerland's Stefanie Voegele on Monday. The world number one, whose only Roland Garros title success came in 2002, will next face Germany's Julia Goerges after securing a 7-6 6-2 victory. However, she was not happy with her performance, telling the official WTA Web site: "I definitely didn't feel good about how I played. "At least I won. I'm still in the tournament -- that's what matters." The American, who has been out of action for three months recently with knee problems, led a succession of seeded players to progress in the women's section. Blog: Should the French Open leave Roland Garros? Third seed Caroline Wozniacki was in majestic form as she also moved into the last 64. I definitely didn't feel good about how I played. The Dane had to retire from an event in Warsaw last week because of an ankle injury, but the 19-year-old showed no ill effects in taking the opening seven games on her way to a comfortable 6-0 6-3 success over Russian Alla Kudryavtseva. Russian fifth seed Elena Dementieva swatted aside Croatian Petra Martic 6-1 6-1, while 11th seed Li Na was made to work slightly harder in getting past promising French teenager Kristina Mladenovic 7-5 6-3. Fourth seed and former semifinalist Jelena Jankovic was one of the last seeds to play on the day, but the long wait did not seem to disturb her as she brushed aside Alicia Molik 6-0 6-4. Seventh seed Samantha Stosur was given some anxious moments in the first set before getting past Simona Halep 7-5 6-1. Eighth seed Agnieszka Radwanska proved too strong for Briton Elena Baltacha, going through 6-0 7-5 and there were also victories for Francesca Schiavone (17), Lucie Safarova (24) and Kateryna Bondarenko (32). On a day of no shocks, there were minor scares for 17th seed Francesca Schiavone and 27th seed Alona Bondarenko. Both lost the first sets -- against Regina Kulikova and Vera Dushevina -- before recovering to win 5-7 6-3 6-4 and 6-7 6-3 6-4.